This is a white 1 inch pin badge with Happy Valentines Day written in decorative pink font and of course a love heart at the bottom. It wouldn't be a Valentine badge without a cute love heart. So if you need a small romantic token for the one you love - why not use this handmade made to tell them that they're your Valentine. 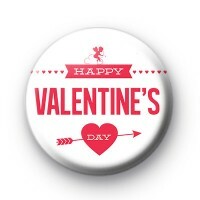 We have a huge range of Valentines, love and even a few Anti-Valentines day badges in the shop. Free delivery available on larger orders.